The third season of MasterChef Vietnam will feature local celebrities to infuse a new spirit into the program. 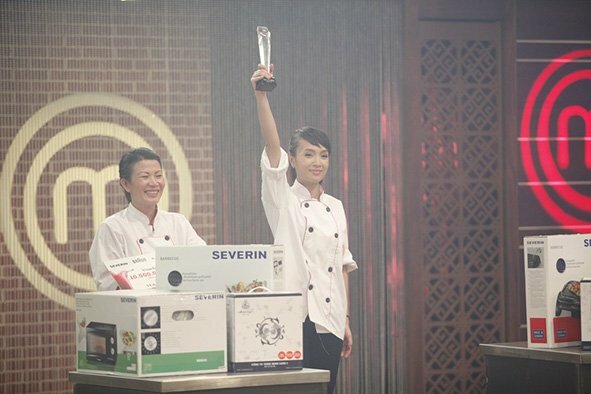 MasterChef Vietnam in 2014 Hoang Minh Nhat holds her trophy at the coronation night last year. This year’s program organized by Vietnam Television (VTV), BHD Company and Knorr brand from Unilever Vietnam will run auditions to search for contestants in Hanoi and HCMC in mid-July. In the new format, celebrities will compete with amateur contestants to show their cooking talent and creative dishes to TV viewers. The winner will get a prize of VND500 million and a cook book deal. MasterChef Vietnam season 3 will consist of 15 episodes that are broadcast every Saturday at 8 p.m. on VTV3, starting from mid-August. Winners of the first and second seasons, Vietnamese Australian chef Ngo Thanh Hoa and the 24-year-old Hanoi lass Hoang Minh Nhat are running their own food businesses in HCMC and Hanoi. Further information on venue and time of the auditions in Hanoi and HCMC is available at https://www.facebook.com/VuadaubepVietnam as well as www.vuadaubep.vtv.vn.